Black pepper (Piper nigrum) is commonly dried and used as a spice the world over. In earlier times, although pepper was widely well-known as a seasoning, it was very costly which only the affluent could afford. In fact, the Dutch even today use the expression “peperduur” in their language, meaning ‘pepper expensive’ for something that is very expensive. 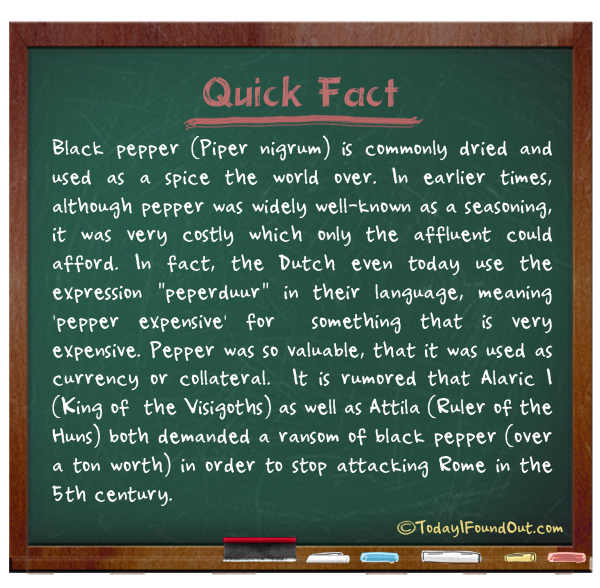 Pepper was so valuable, that it was used as currency or collateral. It is rumored that Alaric I (King of the Visigoths) as well as Attila (Ruler of the Huns) both demanded a ransom of black pepper (over a ton worth) in order to stop attacking Rome in the 5th century.